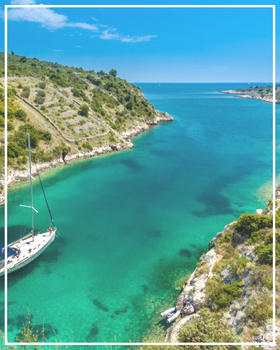 With a coast which varies between steep cliffs, beaches of fine sand, isolated bays, numerous World Heritage and UNESCO sites and a warm welcome, it is impossible not to fall in love with the charm of Croatia! A much loved destination by many, this Eastern European country, with a long coastline along the Adriatic Sea, captures the hearts of all those who take the time to travel there. Croatia charms all its visitors with the vast amount of things to do in the country. During your time there be sure to pay a visit to the fortress of Dubrovnik, a city museum that has been a UNESCO World Heritage Site since 1979. Lovers of beautiful scenery and photogenic landscapes will most definitely not be disappointed as Plitvice Lakes National Park is a real asset to Croatia due to its breathtaking views. You will surely be amazed here by the power of nature and the way it works its magic to carve such beautiful scenery. Furthermore, you can enjoy a nice, relaxing day on one of the many beautiful beaches that line the coast. Lovers of delightful food won't be disappointed in Croatia either as this country is a cultural crossroads for Central Europe and the Mediterranean. The gastronomy in Croatia has many surprises to satisfy the tastebuds of even the fussiest eaters. Gastronomy in Croatia is very much part of its cultural heritage and you will simply be astounded by the selection on offer - be sure to try the octopus salad and the Cevapcici - a dish made with meatballs and onions - a real delight! From the Istrian Peninsular to Dubrovnik discover our selection of luxury villas in Croatia. From the Adriatic coast to the heart of the Croatian countryside, all our properties offer superbly appointed living spaces in houses of exceptional beauty. Our prestigious homes in Croatia offer you your very own swimming pool so you can relax under the heat of the radiant sun. And for an absolutely perfect holiday, additional facilities such as a chef, car rental, baby-sitting services etc. are available in addition to your villa rental in Croatia.